"EMFs work through the voltage sensor to activate the channel and radically increase intracellular levels into dangerous ranges." So that's why when I was on kava I felt better and extreme amounts of free radicals are created. That's what we need to target if we want protection but either way the root of the issue that doesn't have to be there is the devastating effect or these dangerous technologies we have today with no protection by default and a rapidly expanding use of them at that. People just get sicker and sicker, but the real reason why under it all is just swept under the rug because this is a huge part of it. I'm evidence you can endure and get some of your humanity back but it's a battle I'm noticing. Half the people I see with these bluetooth wireless headsets and head phones are like zombies, you can tell it's killing them just by watching their motor, language interpretation, and speech deterioration from using them all the time but when it gets so bad it can't be ignored everything but the actual issue will be addressed and the wireless train will keep on chugging. Same range of either negative or completely flat lined emotions too. I work in customer service interacting with tons of people every day, don't lie to me and tell me it's not. Can you tell what the difference is between someone who is extremely sick by how they appear in many situations and someone who is what we would call healthy or normal? There you go. I feel even worse for the people who work in modern fast food restaurants with the headsets on all the time and what's going on in the kitchen. It's a vicious cycle. Nothing will be done till the cost of the health problems EMF cause becomes more than the profit EMF make. Not anytime soon in other words. Or if people start demanding their human rights. Sadly democratic popularity is in direct conflict with OUR human rights. Democracy has always discriminated against minorities. None the less HRs are enshrined in law and have been recognised. Sadly though they are only words when profit is at risk and not the public budget allocations. Nothing will change until EHSs stop thinking they are ill and start thinking that they are victims of pollutions and a corrupt legal and medical system that denies their most basic human rights. An acetylcholine esterase inhibitor (AChEI) or anti-cholinesterase is a chemical that inhibits the acetylcholine esterase enzyme from breaking down acetylcholine (Figure 1), thereby increasing both the level and duration of action of the neurotransmitter acetylcholine. Existence of reversible, quasi-irreversible and irreversible inhibitors of ACh like chloropyrifos, Malathion has been reported . Increase in acetylcholine inhibits the release of gonadotrophin releasing hormone (GnRH) and that inhibits release of luteinizing hormone (LH) and follicle stimulating hormone (FSH). It results into inhibition of gametogenesis and steroidogenesis [66,67]. So, it is quiet likely that synthesis of testosterone being a steroid hormone may get hampered that could further result in erectile dysfunction. Pesticides like chlorpyrifos and carbofuran inhibit acetylcholine esterase [68,69]. Hence increased acetylcholine suppresses the reproductive functions [53–57]. Figure 1. Inhibitory action of pesticides on Acetylcholine esterase. Oxidative stress occurs when cells are exposed to excessive levels of reactive oxygen species (ROS) as a result of an imbalance between pro-oxidants and the protective mechanisms conferred by antioxidants . ROS are formed during regular metabolism due to the univalent reduction of oxygen molecule. Superoxide (O2−) is the most important among the ROS. Organophosphate induces production of ROS and hence causes reproductive tissue damage . Atrazine and imidachloroprid is also responsible for oxidative stress by reducing levels of glutathione [59,60]. Hydrogen peroxide (H2O2), hypochlorous acid (HOCL), and peroxynitrite (OONO−) are other important free radicals implicated in the pathophysiological mechanism of vascular disease. The vascularendothelium is the major source for these free radicals. Besides this, platelets and leukocytes are the other important sources of ROS . Superoxide radicals are generated because of incomplete oxygen reduction in the electron transport system. Membrane bound enzymes, such as nicotinamide adenine dinucleotide hydrogenase–nicotinamide adenine dinucleotide phosphate hydrogenase oxidase, are the major source of superoxide radicals in activated phagocytic cells . It has been reported that up regulation of these enzymes is associated with an increased risk of vascular disease [74,75]. Superoxide dismutase (SOD) is an important enzyme that removes the superoxide radicals from the human body. There are 3 types of SOD isoenzymes: cytosolic Cu Zn-SOD, mitochondrial Mn SOD, and extracellular SOD. Extracellular SOD reportedly plays a critical role in maintaining the redox state of vascular interstitium and thereby prevents the pathophysiological effects of superoxide in the vasculature. Extracellular SOD converts superoxide to H2O2. The interaction between NO and ROS is one of the important mechanisms implicated in the pathophysiological process of erectile dysfunction . NO interacts with superoxide to form peroxynitrite, which has been reported to play a central role in atherogenesis . The stability of peroxynitrite allows a greater opportunity for it to diffuse through a cell to find a target. The unusual stability of peroxynitrite is due to its being folded into the &-conformation (Figure 2), which cannot directly isomerize to the much more stable form, nitrate . Peroxynitrite reacts with the tyrosyl residue of proteins, which inactivates superoxide dismutase and leads to increased amount of superoxide . This further increases the formation of peroxynitrite and reduces the available NO concentration. Peroxynitrite causes smooth-muscle relaxation and is less potent than NO. The effect of NO and peroxynitrite have been studied on stripped cavernosal tissue from rabbits . They reported that relaxation induced by NO is short lived and immediate in onset compared with that due to peroxynitrite, which is prolonged and slow in onset. Moreover, the tissues returned to original tension immediately with NO, whereas with peroxynitrite, the tissues were unable to recover their original tension. These mechanisms ultimately produce an ineffective relaxation in cavernosal tissue, which produces erectile dysfunction shown in Figure 3. Figure 2. Pesticides causing oxidative stress. Figure 3. 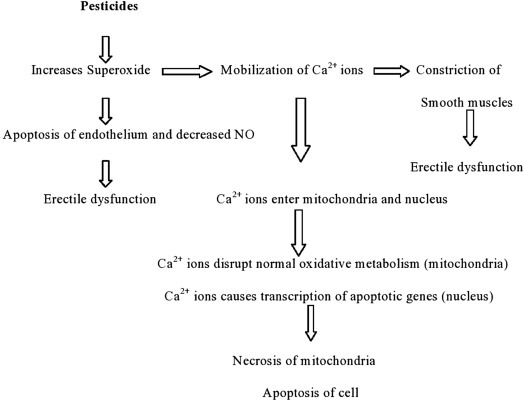 Apoptotic and necrotic action of pesticides. The new findings are consistent with the well-known involvement Ca2+ in cell death from oxidative stress. Oxidative stress causes Ca2+ influx into the cytoplasm from the extracellular environment and from the endoplasmic reticulum . Rising Ca2+ concentration in the cytoplasm in turn causes Ca2+ influx into the mitochondria and nuclei. In the mitochondria, Ca2+ accelerates the disruption of normal oxidative metabolism leading to necrotic cell death. In nuclei, Ca2+ modulates gene transcription and nucleases that control apoptosis (programmed cell death that involves fragmentation of DNA). Insecticides and pesticides has been shown to act as reproductive toxicants in male rats and histologically induce severe focal necrosis of the germinal cells in seminiferous tubules associated with tubular atrophy (shown in Figure 3). [81–83] NO interact with peroxide to form peroxynitrile. Peroxynitrite and superoxide have been reported to increase the incidence of apoptosis in the endothelium. This leads to denudation of endothelium and reduction of available NO [77,79]. Currently, the following are considered biomarkers of vascular endothelial dysfunction: insulin resistance, homocysteinemia, lipoprotein (a), endogenous nitric oxide (NO) synthesis inhibitors, vasodilators (nitrites, nitrates, and 6-keto prostaglandin F1a), adhesion molecules (vascular adhesion molecule-1 [VCAM-1], intercellular adhesion molecule-1 [ICAM-1], and P- and E-selectins), and thrombotic hemostatic factors . Since, endothelium is made up of endothelial cells and these cells are responsible for NO production via eNOS. Superoxide is reported to have a direct vasoconstriction effect through mobilization of calcium ions . This can potentially produce ED. According to the literature, the decreased availability of NO is the key pathophysiological process that leads to erectile dysfunction . The relevance of the above is that exposure to NI radiations has the same effect as an acetylcholine esterase inhibitor (AChEI) or anti-cholinesterase. This means that if your lucky enough not to be exposed to pesticide you are getting the same poisoning effect from NI radiations.